Notes: This is a sacred oratorio for solo voices, double choir and double orchestra. The conductor is the Belgian Philippe Herreweghe. Links: More information about the piece. Ubuntu 12.04 LTS hasn't even come out yet and the Ubuntu team is already busy scheduling the roadmap to Ubuntu 12.10. What will it be called? Q...Quail? What will be in store for us in the next release? The Ubuntu 12.10 release date comes from the tentative release schedule for the post-Precise release, which has been published online. In keeping with the last few development cycles a total of 3 alphas and 2 beta releases are planned. Alpha 1 is pegged for release on June 7th, with the first beta following a few months later on September 6th. The full list of dates is as follows, but do be aware that they are subject to change. Classed as a serious psychological thriller anime, Mirai Nikki delivers us with the most thrilling anime I have watch since Ga-Rei: Zero. What you see is not what it seems. Mirai Nikki will influence your emotions a lot. At first the story doesn't seem too bad- until you meet the twelve. Twelve mentally unstable contestants that wants to win the competition no matter what it takes. Here we see Yuki, a lonely boy that is closed off to the outside world just writing in his diary. As such, he is chosen to be one of the contestants to battle out for the top job. Sounds simple? Afraid not. Along the way he meets friends, foes and discovers horrific truths, hidden agendas and broken promises. Trust and betrayal are pretty much what holds this anime together as Yuki finds out that friends can be either allies or enemies. The mystery deepens as he is constantly stalked by his psycho killer 'girlfriend' who seems to stop anyone that wants to become closer to him. On top of that, he has to deal with the other combatants whilst protecting his diary from harm. The story is fast paced and full of action. Mirai Nikki is a true psychological thriller and may seem innocent at first but the dark side of it reveals itself as the series continue. With an unexpected ending, what will happen in the future? The art work is well illustrated and animated with some nice lighting effects and character decals. The nice use of overtones and 'noir' style dark alleys just adds to the thrilling affects of this whole anime. The various special effects are just so well animated from the various colourful explosions of buildings to the muzzle flash of gunfire. Even the small details in the background environment were drawn precisely. Well done for such a quick moving and imaginative anime. The theme songs were appropriate for Mirai Nikki and I had no problems with voice acting. Although, Gasai Yuno would get on your nerves a bit with her constant 'Yuki~' name calling. On the other hand, Yuki's voice acting perfectly suited him. The characters were meant to be only 14 years old but I don't think 14 year olds sound like that. The other contestant's voice acting were also appropriate for their type of character. No complaints here. It is all about the character here. Yuki is meant to be 14, but I can't really imagine 14 year olds would be doing all this horrific stuff they did in the anime. I would be more comfortable if they were above 16. So there is a sense of unrealism in the anime. Heck, the whole anime is just unrealistic, which it is meant to be. I won't spoil too much information here but the other 11 contestants are totally different from each other, having their own values and moral standards. In the end, it is up to Yuki to either save them or break them. You will definitely show mixed reactions and emotions to Yuno as she mysteriously hold a dark secret that will change the game. In the end, it was one thrilling ride from start to finish. I definitely had strong mixed reactions to the many scenes throughout the anime. Right from the start, you are given a glimpse of what happened in the past, but you don't come to realize that until near the end. 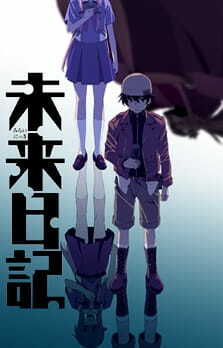 Mirai Nikki will make you feel shocked, impressed, disgusted, depressed, happy, scared or everything in between. Be prepared as what you see is not what it seems. Lies are everywhere. Even this cake. What a thrilling story right from the start. The action is packed so you will never be bored. Well animated and illustrated action scenes and flashback scenarios. Appropriate theme songs and good voice acting. Many characters that will definitely affect more or less depending on how you view the situation. Thrilling. Just thrilling. Both emotionally and psychologically affected in one way or another. If you are into mystery and psychological thriller anime then this is perfect for you.